I used to think I hated radishes. They would make appearances on veggie spreads or in salads at graduation parties, Easter platters, etc and I would shun them. 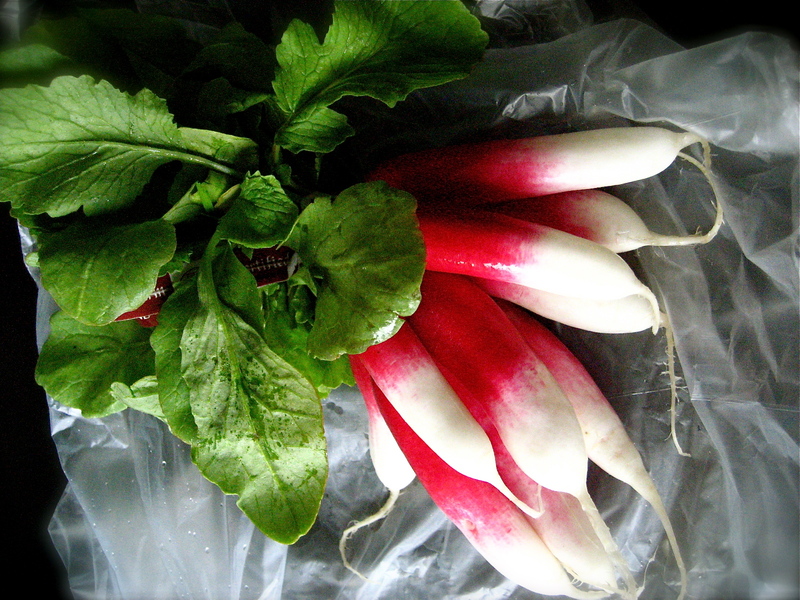 My conversion to radish admirer happened last summer, when a bunch of “French Breakfast Radishes” appeared in our CSA box. Unlike the dry, rock-like radishes of my past, these radishes were pink, delicate, succulent and absolutely delicious. I tried them out of a sense of obligation (after all, Trisha went to all the trouble of growing them) and what do you know – they were great. These are particular breakfast radishes are a bit larger than that first bunch, but just as tasty. Thanks to Deborah, we tried them on a baguette with fresh butter… WOW. Pink and white perfection. Ah, the thrill of a new veggie! At the Harmony Valley booth this week I picked up a bunch of hon tsai tai. What is this new green friend? The internet tells me that it’s like a flowering bok choy (another veggie that I am still learning about). It’s supposedly really yummy in stir fry, and is technically part of the mustard family. I tend to love all things mustard, so hopefully hon tsai tai and I hit it off. For more info (and some recipe links), I found this link to Green Your Plate. I wish I had been more on the ball and written down the name of Diane’s farm – I’ll have to bring a pad and paper next week. Her spicy salad mix is really quite biting and absolutely delectable. We’re getting to be on a first name basis (rather than me just being the overly enthusiastic buyer that swings by her stand, slobbering with salad green excitement), and I feel glad about that. She and her family are lovely, even in rainy 34 degree weather . 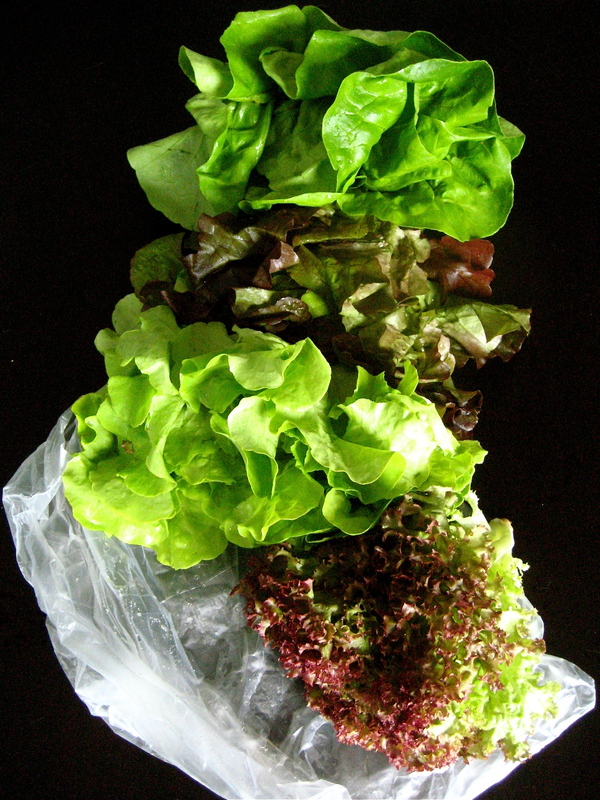 Again, I wish I had written down the names of these 4 varieties of Snug Haven lettuce. All were delicious, in their own unique ways. I cannot say enough positive things about Snug Haven. Not only is their produce amazing, but Bill and Judy are incredibly kind. And Hilarious. 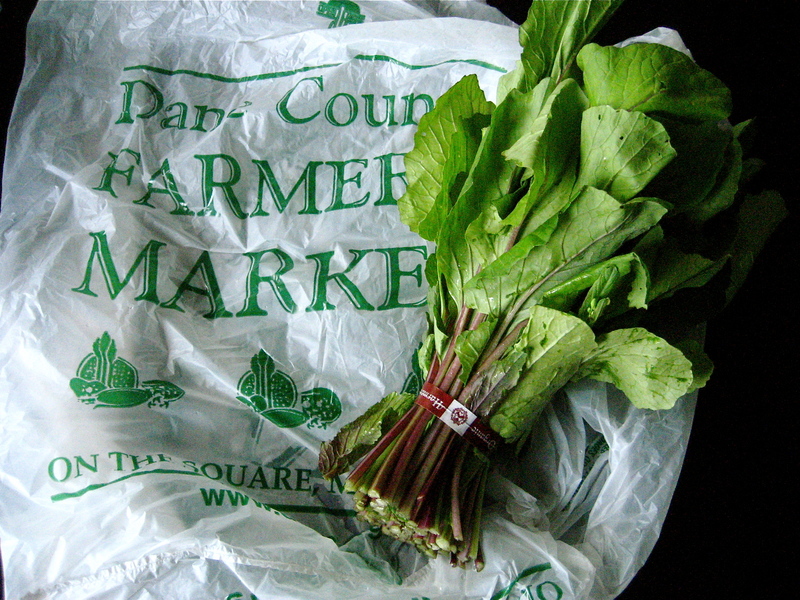 Top restaurants in Madison and Chicago purchase Snug Haven produce, and sometimes I can’t believe I get to have access to the same delectable stuff. And guess how much each of those cost me? $1 per head. Bill, knowing that AmeriCorps = no $$ and having a plentiful supply of lettuce this week, cut me an amazing (and unsolicited) deal. I still feel warm, fuzzy and special about it. Thank you Snug Haven! That’s it for this past market! The weather was hot and sunny, which meant the crowd was almost crushing when we got to the market in the morning. Neither Emily nor myself are really much for shopping in a hot crowd, so we ducked out earlier than usual. 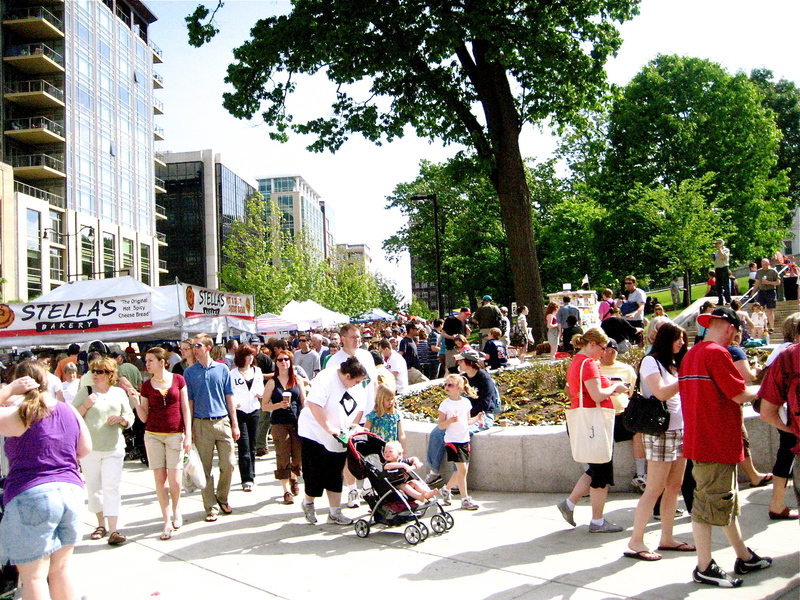 It’s time to start showing up early again, before the throngs of ambling strollers! from → Adventure, Farmer's Market, Food, New Food! yum!! makes me want to make and eat a salad. those greens look amazing, steph! those might be the prettiest radishes i’ve ever seen! 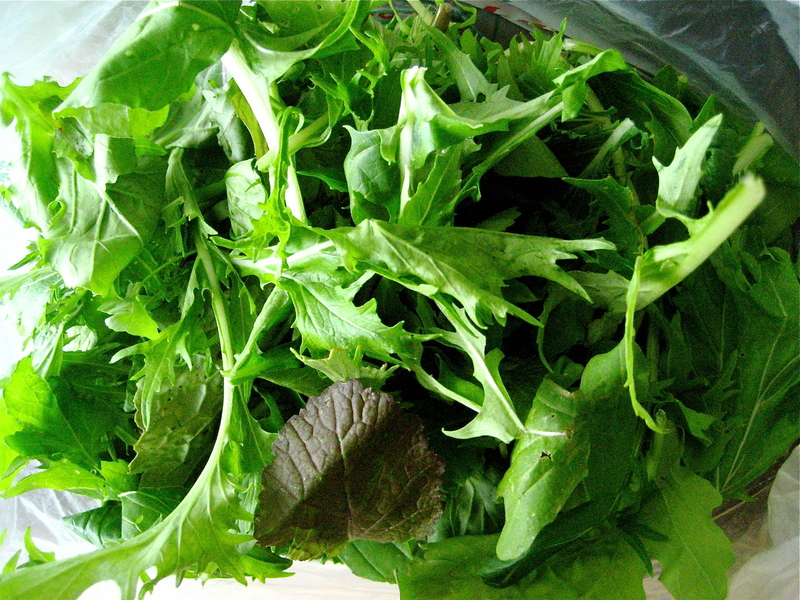 I LOVE mustard greens. Sautéed with onions, garlic, bacon, and finished with lemon juice. Now I’m hungry. I don’t think my comments are getting through.